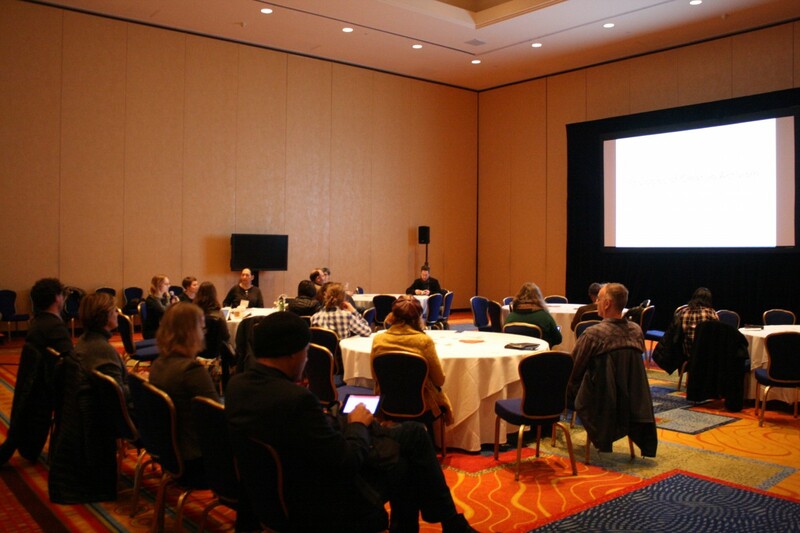 The opportunity to present our work at the New Media Caucus panel Ecologies of Creative Activism at the CAA conference gave us the occasion for a trip overseas to visit Washington D.C and New York. We worked out our jet-lag before the conference by visiting most of the Smithsonian museums. Museums are often a great source for inspiration specially when they connect with a current research topic. This was the case with the National Museum of Natural History where we spent several hours during two days in the Gems and Minerals gallery following our research at the Department of Mineral Sciences. Due to the ‘Behind the Smart World’ research lab that we have been curating the last year, we have gained an interest in understanding how rare earth minerals are used in electronics. In the gallery, it was interesting to see how not only rare earth elements but also other elements extracted from minerals are really the building blocks for magnets, displays, and electronics in all of our information technology gadgets. Our ability to communicate and create as much of our other needs in life really depends upon mining. These extremely beautiful crystal-formed chemical elements are refined for use in everything from our kitchenwear to pesticides and of course in our computers, phones, TV-screens, etc. What is problematic with mining is that it has severe ecological impact and refining minerals is a very toxic business. At the New Media Caucus panel we met Andrea Steves & Timothy Furstnau who work together as the Fictilis group. They have been working around the topic of waste and e-waste as well and in later discussions we all agreed on that when we talk about electronic waste we also have to think about the waste produced in the production of our electronics which is a much bigger, but less visible part of electronic waste. Food, agriculture, animal-farming, waste and online anti-fraud activism were the main topics of the ‘Ecologies of Creative Activism’ panel chaired by Stacey Storms. The topics differed a lot, but what was common in all of our practices was an element of collaboration an co-creation. As artists and artist groups, all of us found it important that the works, in one way or another, are connected to a community. No matter if it is a connection to other goat farmers, or understanding motives and learning strategies of activists who use creative strategies to prevent cyber-crime, or locals who are interested where our crap ends up it is flushed down the toilet. All presented projects with elements of gathering and sharing knowledge together with others. 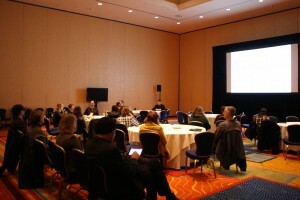 In addition to the panel we also had a chance to present our latest work Megacorp., at the New Media Caucus Showcase. This was an evening event at the beautiful auditorium of Corcoran School of the Arts + Design at the George Washington University. Here, fifteen artist or artist groups each had six minutes of time to present their work. Of course, the themes and topics varied enormously and presentation styles ranged from classical slide presentations to audiovisual manifestos and dance performances, yet the format worked well with the networking reception that took place afterwards. We returned some days later to the Corcoran School of the Arts + Design for the opening of the ‘Wildcat Hauling’exhibition by Fictilis. The Wildcat Hauling project is interesting and it showed us that the problem of dumping electronic waste is not just a problem of developing countries like we experienced during a research trip to Ghana. It also happens in poor neighborhoods of developed countries, places that are often designed to be as hidden as other far away places where our trash ends up out of our sight. After the New Media Caucus showcase and panel participation, we spent five days in New York City where we continued our “passive reconnaissance” observations of fraudulent Megacorp. businesses. The Megacorp. is a corporate conglomerate inspired by its equally powerful counterparts in science fiction. The artwork is based on a collection of fraudulent websites that we scraped from the Internet and analyzed in an artistic installation. Part of the research is to visit the addresses where the companies claim to have their headquarters and look for traces of the fraudsters. This way we could document 12 additional business locations that will become part of a video work. Visiting all of these addresses was another way of exploring the city. It took most of our days in New York to travel from one location to another, but we had time for some exhibitions in between. One of the most contemporary exhibitions was the #makeamericagreatagain at Whitebox gallery. This group exhibition, curated by Raul Zamudio, Juan Puntes and Co-curated by Blanca de la Torre, coexists with the Democratic and Republican primaries, which had just started during our visit. The exhibition title is extracted from Donald Trump’s campaign slogan and it critically examines the fear-arousing rhetoric in the American social and political landscape. The hash tagged title of the exhibition also aims to encourage visitors to share images and comments from the exhibition as an intervention that interferes with existing social media sites created for Trump’s campaign. Some of the artworks, such as the Donald Trump piñata by artist Pablo Helguera, were rather direct comments on the primaries. Other works, such as Nora Ligorano and Marshall Reese video work of a melting ice sculpture of the phrase ‘middle class’, reflect more deeply upon the fears of a disappearing middle class. According to social scientists, one of the reasons for Trump’s success lies in the fears of a white middle class losing their privilege. The article, The Rise of American Authoritarianism, presents an angle on the current political landscape in USA, but it is easy to draw parallels to existing political movements in Europe as well. Both the exhibition and the article reflect upon the fear that current politics is generating in the American public. For example, artist Farideh Sakhaeifar approaches the theme of war from a curious perspective in her work, “Acquired from the above by the present owner”, in which she documents how U.S. and British Army gear that have been smuggled from Iraq and Afghanistan, are sold on the black market in Iran. By purchasing these items and interviewing Iranian families that sell illegal military accessories, Sakhaeifar offers alternative stories to these items connected to war. Also included was Joseph De Lappe’s participatory project that is a commentary on American war policies, particularly the use of drones. In his work, “In drones we trust”, he makes drone stamps and green ink available and encourages visitors to make drones also visible on the dollar bills (best suited on the 20 dollar bill). The exhibition blends activism, social awareness and art through interference on social media, and is hopefully generating some new questions in the minds of the general public as well. We found another exhibition with a compelling subject at Apexart. The “Setting out” exhibition, organized by Shona Kitchen, Aly Ogasian and Jennifer Dalton Vincent, “seeks to untangle the terms that motivate and define contemporary expeditions”. This exhibition does not focus on artists or artworks in itself, but blends together artists’ expeditions with archival materials from the Museum of Natural History. No matter if the explorer is an artist or a scientist, the numerous items, images, books, maps and tools collected on tables and walls speak about human curiosity to see beyond each horizon. It is hard to understand the meaning of each item on display, or even how they connect, but the overall feeling about the exhibition portrays the process of artistic research, in which topics are approached without quite knowing what one is doing, but the often playful strategies result in new understandings. In some of the projects, science and fiction merge, such as in Agnes Meyer-Brandis’ Moon Goose Analogue. This fascinating coexistent of science and imagination was also presented in a small exhibition called “Fantastic Worlds: Science and Fiction 1780-1910” at the National Museum of American History. This exhibition presented a time in history when new technologies, exhibitions to the arctic or undersea, new knowledge about the universe, or discovery of dinosaur fossils were inspiring the emerging genre of science fiction. In combination, these two exhibitions showed why the union of art and science often results in amazing discoveries.